There are various types of bamboo including white bamboo, black bamboo, tiger-stripe bamboo, smoked bamboo and spotted bamboo and we make our products selecting the right type of bamboo for the application. Above all, the goodness of bamboo lies in the beauty of its surface. 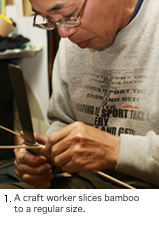 Miura craft workers plait bamboo into sheets and make frames by bending bamboo into curves using the traditional sasara split bamboo technique and make the beauty and subtlety of the bamboo's surface stand out. ※Click on a photo to change the image and caption on the left.